This wonderful croton cultivar is widely cultivated in the Canary Islands since immemorial time. These older cultivars are hardier than others to wind and drought. It has lots of green in the leaves, so growth is very robust. By buying this product you can collect up to 8 loyalty points. This wonderful croton cultivar is widely cultivated in the Canary Islands since immemorial time. Leaves are remarkably deeply cut, often trilobate. They have a very dark green background and a yellow part, often consisting in a perfect yellow stripe in the middle. These older cultivars are hardier than others to wind and drought. It has lots of green in the leaves, so growth is very robust. Here it is called Rooster's Foot, Pata de Gallo. International names are Conspicua, Mrs. Fred Sander and Brasil, but names in this case are a bit controversial, because this is not a mothern hybrid with a registered name: it is an older type from the past. 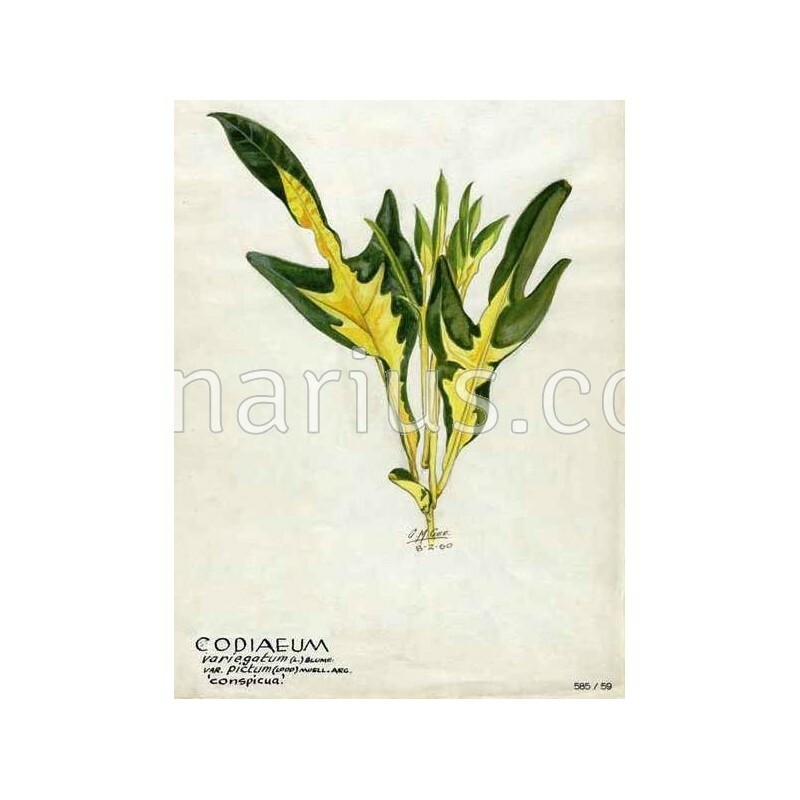 Codiaeum shrubs are often commonly called crotons, and widely used in tropical gardens, because of their colourful glossy leaves. They are also cultivated as house plants througout the world. They are shrubs native to Malaysia and the larger islands in the Pacific. Crotons natural habitat is open forests and thickets. They do stand shade for months as well as indoor conditions, but they will grow best in high light and will enjoy some hours of direct sunlight. They are very good house plants for a bright room and will stand the dry air of heating much better than other plants. Allow the soil surface to dry slightly between watering. 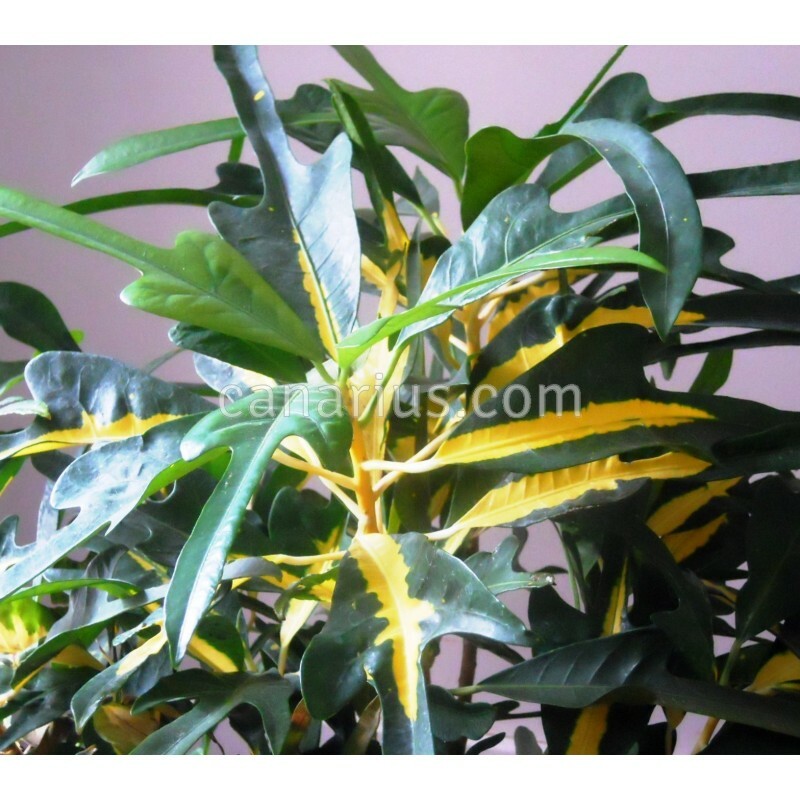 Crotons are sensitive to cold and should be kept above 8 C. They enjoy tropical or subtropical conditions, while they do not grow outdoors in the Mediterranean.